I enjoyed chatting with Holly Tse about blogging and how it can help you learn more about life, connect with people, save time, and do awesome. For the next day or so (Aug 17), you can listen to a free recording of my interview with Holly at http://instantteleseminar.com/?eventid=21913131 . I’m working on putting together a transcript and some follow-up notes, but here are some quick thoughts. Trying to figure out how to write about something possibly sensitive or offensive? Take a step back and try to take a really, really positive approach. Don’t focus on past hurts, focus on how to move forward. Don’t focus on what other people are doing wrong, focus on what you can do and what you can change about yourself. Write through things in your private notes if you need to, then see what insights and ideas you can share with others. You might be boring. In fact, you almost certainly will bore yourself from time to time. Writing will feel awkward if you haven’t been doing it a lot, and even if you have, it can still be frustrating. Keep writing. Don’t worry about being interesting. Don’t worry if no one reads your notes. Write in order to think clearly, write in order to remember, and write in order to share. You can grow into a good writer, but only if you write. You don’t need to win the Pulitzer Prize to write notes that can help you and other people. How frequently should you write? As frequently as you can or would like to. =) Don’t beat yourself up if you can’t post every day or you blog sporadically. That said, try using writing as a tool for thinking. Try asking yourself questions like: What do I want to remember? What did I learn today? What do I want to do better tomorrow? What do I want to work on learning? If you do that, you’ll probably find that there’s a ton of stuff worth writing about. More thoughts to follow. Feel free to ask more questions! Leave a comment so that other people can also share their thoughts with you, or use the contact form to get in touch with me. Have fun! As part of the grade 8 graduation ceremony, J- and the other grade 7 students spoke about the students who were going on to high school. J- was initially unsure about her speech. She didn’t know much about her honoree beyond a few short facts and a couple of stories from her interview. Her speech reflected it: generalities like “nice” and “funny”, and two pieces from the interview that were strung together with little transition. We helped her edit her speech. She found ways to connect the pieces, trim unneeded words, and become more specific. Larger fonts and more space between lines simplified reading. Slashes helped her find places to breathe and remember to make eye contact. It wasn’t perfect, but it had fewer filler phrases, and it flowed more smoothly than her first draft. She rehearsed with the cat-tree as an ad-hoc podium. She didn’t drill it endlessly, but she practised it enough to get a sense of how the words felt. When she delivered the speech, she got laughs – and high-fives, fistbumps, and compliments afterwards. There’s a beginning, perhaps – that feeling of competence, that “hey I can do this”, the way that the music notes of her favourite songs are beginning to melt into melodies and her writing is becoming more about thought instead of mechanics. One of the key things in helping people learn, I think, is to nudge people over that hump and into that “I rock” experience, so that they get to the point of being able to enjoy it. I wonder how more people can get over that hump and enjoy exploring and sharing ideas. 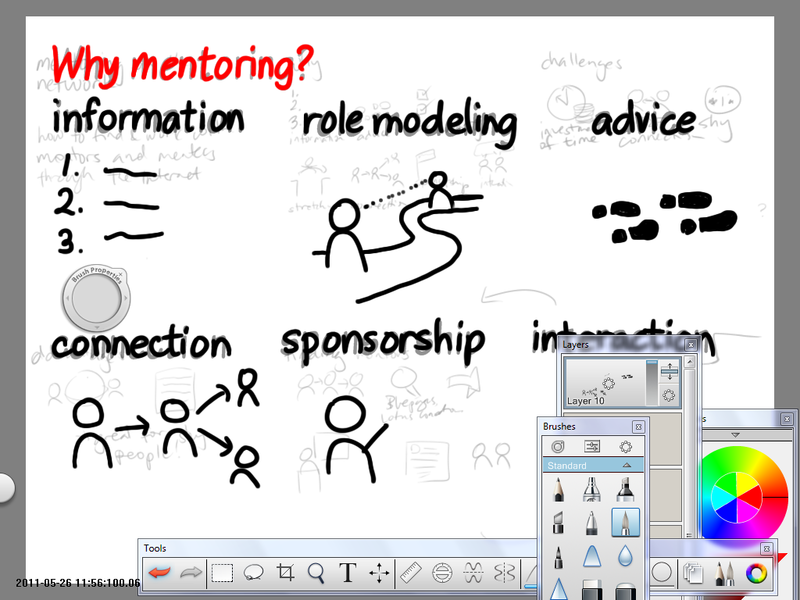 I’ve been using Autodesk Sketchbook Pro to do more and more of my presentation planning, too. The workflow is slightly different from Microsoft OneNote. With OneNote, I can draw storyboards, then scale up the storyboards without any loss of information and without jaggy lines. (The joys of vector drawing!) Autodesk Sketchbook Pro lets me scale up rough sketches, but the interpolation isn’t always smooth. Instead, I storyboard everything. Then I hide any layers I’m not working with, lower the opacity of my storyboard layer, add new layers on top, and draw each slide as a full-size layer. I do any colouring on a second layer below the ink, so that the black lines stay crisp. The finished layers are easy to copy to a separate presentation program. So how does my Autodesk Sketchbook Pro workflow compare to Inkscape? When I use Inkscape (a proper vector drawing program) for presentations, I usually set up an infinite canvas, and clone a series of rectangles for my storyboard. Inkscape makes it easy to sketch elements here and there, rearranging them on my storyboard, rotating and scaling them to fit. After I do a little masking and line adjusting, I import the finished slides into a presentation program. Simple shapes are easy to colour. If I need to shade things more, I can import the images into GIMP. I can still do text presentations, but they’re a little less fun. ;) Drawing takes time, but I like the practice. How do you do your presentations or drawings? I’m taking a break from working on presentations. Not a long break – there’s still a lot of work that needs to be done – but I need to get myself back into the swing of preparing presentations after spending so many weeks doing development. This means stopping when I can tell my mind is resisting, figuring out why, and tweaking how I work until it works again. Many people would rather watch presentations or flip through slides than read blog posts or books or search results. for presentations. I really should just become okay with slurping in tons of information, digesting it, and regurgitating a summary. The core of the resistence: I’d much rather build cool websites than talk about trends. Development is clear. You know what you know. You know when you’re making progress. You know when you’re correct. At the end of the day, things are better. Presentations are a whole lot fuzzier. There’s this entire Jacobian struggle with a topic, trying to get your arms around it, struggling to understand and be understandable. You’re never quite sure if people will actually change their lives (even a little bit?) after listening to you. I always try to influence people’s lives through presentations. Why spend time preparing or speaking for anything less? But then there’s more risk of rejection – or worse, apathy. I try to use presentations to change my own life, too. At least I learn something, try something, do something. Besides, all the ideas become part of me, raw material for unexpected combinations in the alchemy of learning. It’s a struggle to hold down the imposter syndrome that threatens to choke me. I remind myself that these rough presentations can be drafts for people to improve on, perhaps the spark that triggers something else. It’s okay. Maybe I should stop accepting presentation invitations for now, and focus instead on creating new presentations as a way of deadline-less deliberate practice. I can commit to giving them in person only if I’ve created and revised them already. Maybe I should do what Jonathan Coulton does: set the challenge of making a Thing a week. He’s brilliant and he writes funny songs. Maybe I’ll have more fun making presentations when I get better at making presentations through practice. Research: Find sources, collect statistics and quotes, read extensively, keep notes. Organization: Experiment with structures, revise presentations, organize thoughts. Design: Experiment with graphic design. Try text again. Play with images. Don’t get boxed in. Delivery: Practise. Watch other people’s presentations for inspiration. Experiment. Find the fun in this again. I gave a presentation using Autodesk Sketchbook Pro and desktop-sharing in Lotus Live, and it worked out really well. I think I’ll do this for as many presentations as I can get away with. =) I’ll post a link to the recording when it’s up. It was much more fun and much more flexible than annotating in Microsoft Powerpoint. Here’s how I did it. I pre-drew my one-slide talking points on a single layer so that I wouldn’t have to count on thinking, talking, and drawing all at the same time. I used an idea from children’s activity books: instead of drawing, you can use the eraser to make content appear, like the way you would scratch off black paint to reveal colours. I created a layer on top of my "slide", and I flood-filled this layer with white. I set the opacity of this layer to 90% so that I could see the traces of the images on the layer underneath. That way, I could use an eraser to reveal the sketches below. I selected a large eraser to make it even easier. I also wanted to be able to draw new sketches or highlight items, so I selected a red ballpoint pen as my primary brush. Red goes well with black and white. Because my Lenovo X61 tablet pen has a pen tip and an eraser tip, I could easily flip between revealing pre-drawn sketches and adding new sketches. I drew on the the white layer that I gradually erased to reveal the underlying sketches. This meant that I could quickly remove accents or new sketches without disturbing my pre-drawn sketches. Just in case I needed to go into more detail, I added another layer on top, filled it with white, and hid the layer. That way, I could always unhide it (thus blanking out everything else I’d drawn), add a new transparent layer on top, and sketch away. I hid all the tools I didn’t need, and kept the layers window open on the side so that I could easily switch to another layer. 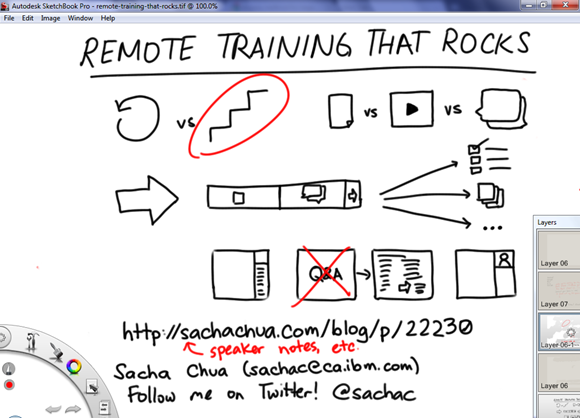 Then it was time to share my screen, turn on the webcam, and give my presentation! The technique should work just as well with any drawing program that supports layers, a web conference that supports screen-sharing, and a tablet or tablet PC that lets you draw or erase easily. Try it out and share your tips!